"I just wanted to drop you an email to say how impressed I was with your photo booth at my daughter's wedding last night. Your photo booth service is incredible. I've seen plenty of photo booths but yours was way above and beyond anything I've experienced. You were so friendly and helpful and for every person to receive a copy of the photographs and have a copy added to an album as they left the booth was fantastic. I know Emma and Thusita loved the album and all the lovely comments written in there that you gave them at the end of the night. All the guests loved re-living the fun memories the following morning at breakfast too. " "We had our wedding day yesterday and Rentabooth went above and beyond what we expected! We went away with a beautiful personalised photobook, keyrings for all the bridal party and all the guests got keepsakes of their time in the booth which was fantastic!!! They kept the atmosphere going in the photobooth and made sure there were always people in there which is fantastic!!!! I couldn't recommend them enough!! " "I attended my granddaughter’s wedding reception where the bride had hired Rentabooth. It was a hot day but this small company provided a masterclass in efficiency from the erection of the booth and equipment itself, to the running of the booth for the duration of the booking. Nothing was too much trouble. Richard owns the business and is assisted by his wife, who makes the guestbook up for the bride and groom over the course of the evening. I understand they have several booths, each manned by two people, and get their bookings mainly by recommendation. I can really see why. Their attention to customer service and detail was first class from the initial booking, to the time they left the venue. The booth was set up just outside the main reception hall and there was a constant stream of visitors the entire time they were there. Loads of accessories were provided from silly hats to wigs and moustaches but even more surprised at how the least likely people donned the daftest accessories and behaved in such an out of character way. It was a lot of fun. The children absolutely loved it and what I really loved was that they were provided with a print each of excellent quality to keep and a duplicate print was put into a bespoke album for the bride and groom. It was presented to them at the end of the evening. Each person that went in the photo booth were asked to leave a written message to the bride and groom next to their photo. It is a lovely memory for my granddaughter and her husband to keep. Most of the guests went back several times and each time they were given a print each and one for the album. When my granddaughter booked Rentabooth, they were not the cheapest but from their recommendations, she decided to book them anyway and in my opinion, they would be very hard to beat and it was absolutely the right decision. I guess it proves that you get what you pay for. They were worth every penny. It’s also worth adding that they have been running professional photo booths for over ten years." 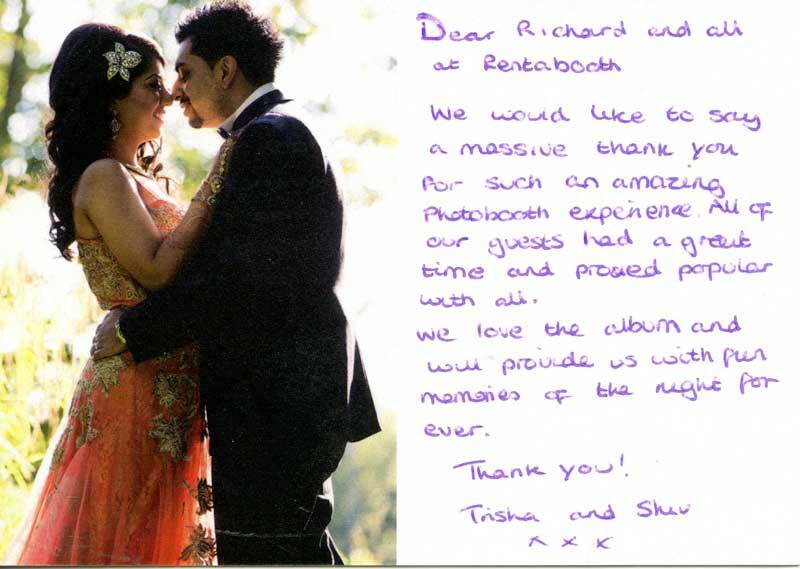 "Comment from Rentabooth - This Thank You card was created and printed by us and Jo & Ben sent one back to us! Thanks Jo & Ben!" "Just wanted to say a huge thank you on behalf of me and Lisa for arranging the Photo Booth on our wedding day. It was a huge hit with all the guests and the book produced was superb with some great images that will stay with us forever! We wanted to add that the staff were excellent and incredibly professional. 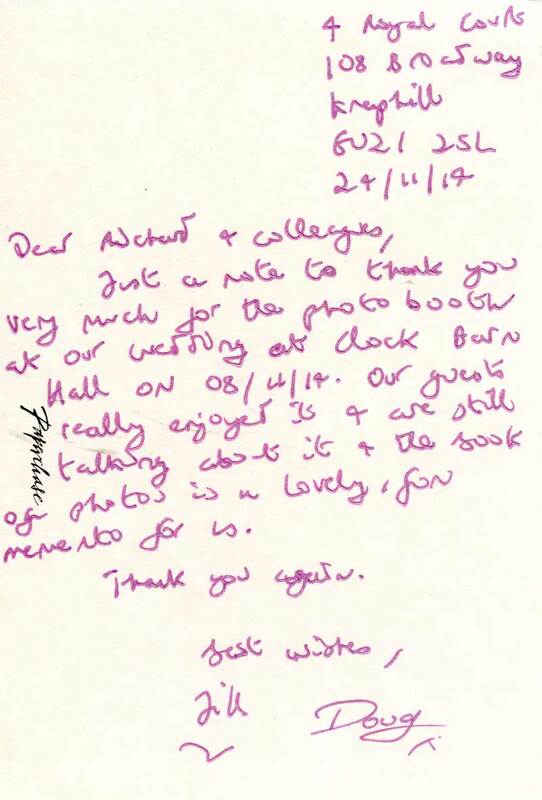 Especially when dealing with hundreds of guests as they ensured that everyone enjoyed themselves and (just as importantly), they all signed the guestbook!" "Fantastic! I boought this for my sister's wedding as a wedding present and it went down a storm! Everyone loved it and the end result was a book that both bride and groom will treasure! Would definitely recommend and such good value for money." "Dear Richard. Words cannot express the gratitude I send to you through this email. Thank you so much to you and Debbie and of course your Rent-a-Booth for making my daughters 21st birthday so amazing. She is the happiest 21 year old on the planet right now which makes me grin from ear to ear. The booth was amazing together with all the props, the service, the pictures, the quality, the speed in which the photos we're produce and the keyrings added that extra little touch. I still have the pleasure of presenting Brea with the beautifully compiled book with all the photos of the evening when she returns from her weekend away and I am so excited to do so tomorrow. I can't thank you enough for making the evening so fantastic everyone really enjoyed themselves and the comments over the social media network were so positive. I have been made out to be a super mum all because of you and your rent-a-booth. Thank you, thank you, thank you from the bottom of my heart." "You came to our wedding in ipswich recently..... Just wanted to say a MASSIVE thank you ! Our personalised book is amazing, so funny, really captured the evening and made us laugh! The personalised service we received made all the difference, no communicating with call centres or central offices I spoke to you and saw you! Everybody who came said it was the best photo booth they've been in, you were all so much fun and really made all the difference ! Would 100% recommend you to anyone, well worth every single penny! Thank you so much!" "Hi Richard - What a great night we had. You were wonderful, absolutely brilliant and the album is fantastic. Please can we book you for David's Bar Mitzvah Sunday July 17, 2016. I think we have some time to discuss the package especially given we haven't booked the hall yet!" "Hope you're well! 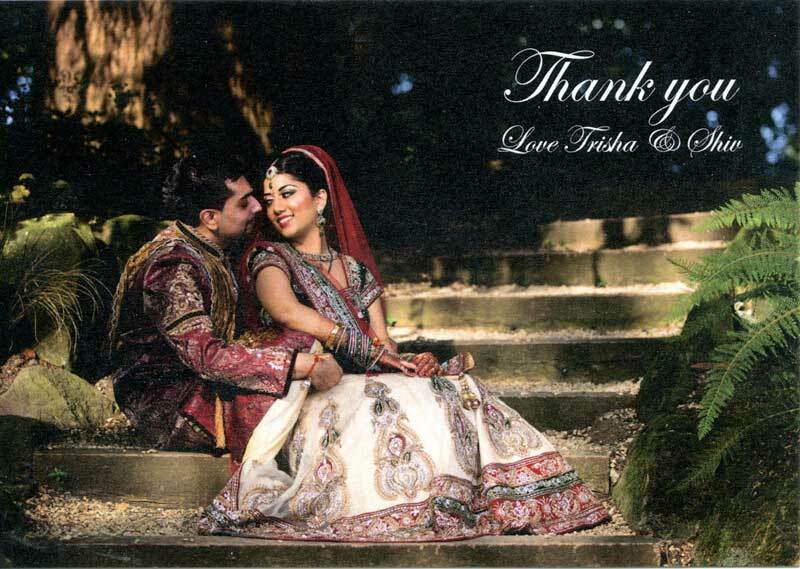 Thank you again SO much for your services on 21st April at our wedding. The photo booth really made the event. Everyone loved it and it's left us with the most wonderful memory book we could have hoped for. It really captured the evening and everyone's personalities. I will not hesitate in recommending Rentabooth to EVERYONE!" "Hope business is booming. We thoroughly enjoyed our photo booth experience, as did most of our guests, who simply can't stop smiling when they talk about it! A definite highlight of the day. it was great to be able to jump the queue with bride privileges!) Thanks." "I just wanted to say a huge thank you for being there on the Night of Stars last month for us. Everyone had a fantastic time and I am seeing photos from both the photo booth and the 007 pictures regularly in the hotels and everyone loves it so much, I don't think we can think of holding next years without you!! Many thanks." "Richard, Teresa and team. Just a note to thank you so much for coming to run the photo booth last month at our wedding. It was hugely popular and we were so delighted with the resulting album - it was just what we hoped it would be! We won't hesitate to recommend you to others in future and wish you all the best." "Richard and Theresa. We would like to say a big thank you for making our evening so special. I have seen many photo booths at weddings and, by far, you guys are the best! Everyone said how great it was and you were both very professional and fun at the same time. Thanks again." "My son had a wonderful party and your photo booth was very much a part of it. Please thank Debbie, Dominic and Theresa for me for all their help." "Thank you so much for Sunday night the photo booth was fantastic. All the kids and the adults loved it. Ella said all her friends felt it was the best photo booth that they had been to. The book looks great also." "Just a quick note to say a HUGE THANKS for your services at our wedding on Friday. The booth went down a storm and so many people commented on how friendly and helpful you were. You really helped make the party perfect and we are now thoroughly enjoying flipping through all the crazy photos that were taken! Thanks again and best wishes for the future." "Just a quick email to say thank you so much for all the hard work you and the team put into our party yesterday. We loved coming home, and going through the guestbook that you so diligently put together over the course of the evening. Loads of comments about how effective the photobooth was, and loads of fantastic memories. Thanks again." "Thank you for a fab night on Friday - everyone thoroughly enjoyed it!! Your booth is a hit!!!" 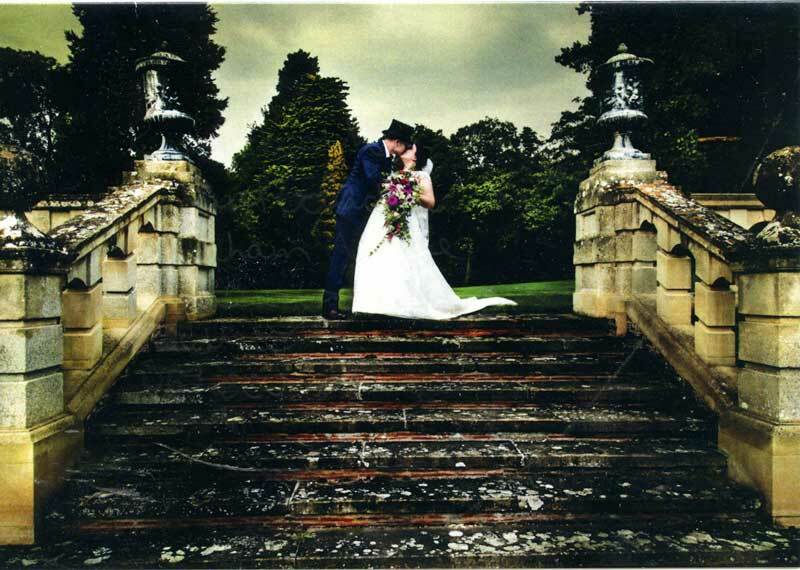 "I just wanted to say thanks so much for the service you provided for our wedding on New Years Eve at Letchworth. All the guests had so much fun and thought it was a great idea. Many thanks." "A huge thank you for Saturday night. Everyone loved the booth - a huge success and amazing pictures and the book is wonderful. " "I just wanted to drop you a line and thank you for doing such a great job on Sunday. We love the album and it is a lovely memory for us all. " "Thanks for the brilliant job you guys did at my brother's wedding"
"Hi guys , firstly we would like to say a big thank u for coming to our civil ceremony on 6th April. It was a big hit and everyone enjoyed themselves." 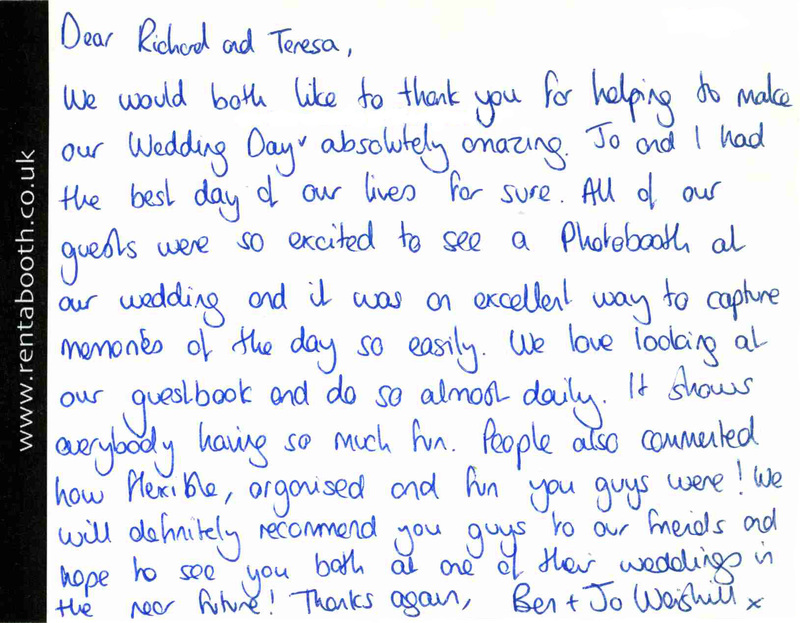 "I just wanted to say a massive thank you for the excellent service and fab photo album we received from our wedding on the 30th March . Our guests loved the booth and I would have no hesitation in recommending you to others. Thanks." 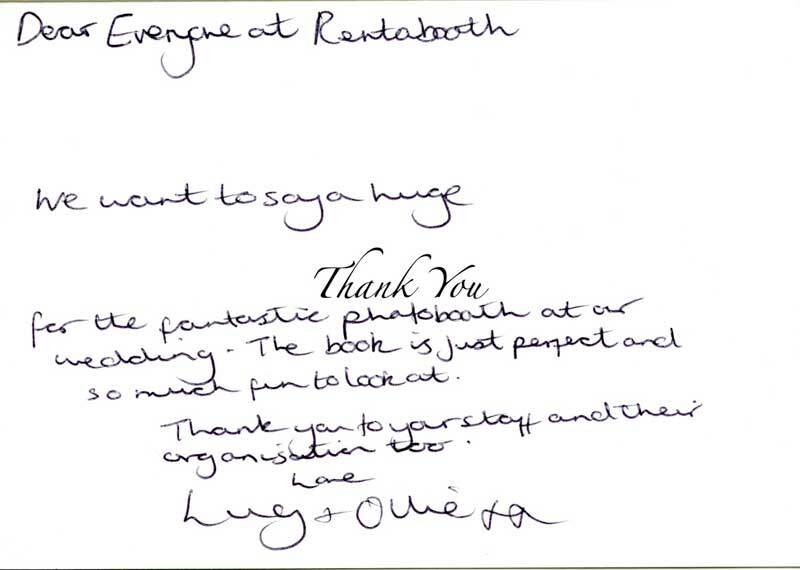 "The booth was a great success and all our guests thoroughly enjoyed it, we both love the book too! Many thanks"
"Thank you so much for providing the photobooth for Sally's party. It was as ever, such great fun and went down brilliantly with everyone. Thank you and I will no doubt be booking you again for the next friends or family birthday celebration." 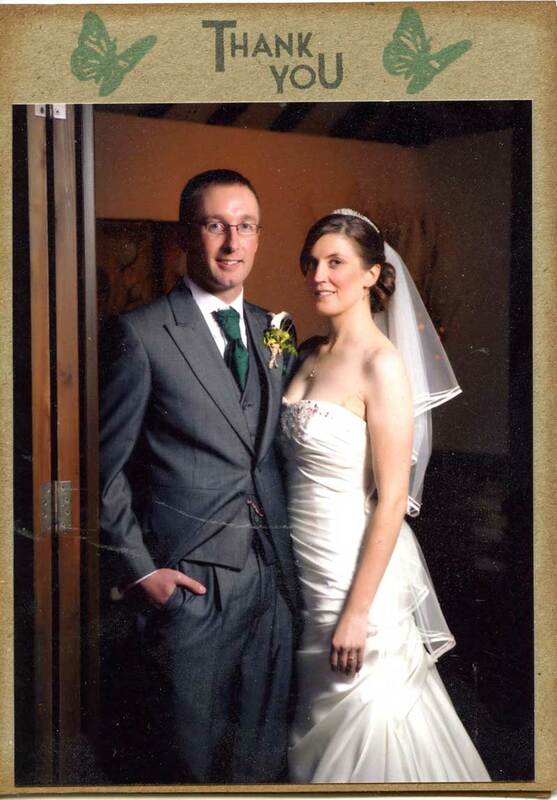 "Just wanted to send a quick email to say thank you for everything you provided on the 26th May at our wedding. Everyone loved the photobooth and the photobook is absolutely amazing and will provide us with great memories of the night for a long time." "Thank -you for the superb work your staff did at Photobooth on our Wedding on Friday :) Everyone loved it and we hope you get more business from our booking :) "
"I hope you remember us! You did a fantastic job at our daughter's Batmiyzvah in June 2010 - Ella. We would love to have Rentabooth again for Nathans Barmitzvah." 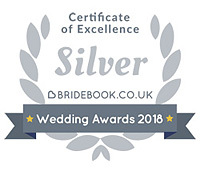 "Just back from Honeymoon now and just wanted to extend our thanks once again for such a fantastic service that you guys provided for our wedding on 8 June. Everyone is still talking about the booth so I will get on and do a testimonal soon enough." "To Richard and Teresa, A massive thank you for our photo booth this past weekend, it was a huge hit and nearly everybody had a go. Everybody was and will be talking about it for a long time and we are very grateful for the fun atmosphere it helped to create. Thank you again." "Sorry it's taken me so long to send this email, things have been extremely busy since the wedding! I just wanted to say thank you so much to you and your team for providing the photobooth at our wedding in Suffolk on 26th May . The team that you sent to run the booth gave us impeccable service so please send on our direct thanks to them.So many of our guests commented on what a good idea the photobooth was but also on the friendliness and professionalism of the team.Looking at our guestbook has given us so much joy, we really can't thank you enough. I have recommended you on a wedding forum, if I can do anything else to spread the word about you please let me know." "Firstly, we wanted to thank you for the booth at our wedding on the 23rd. We have been to lots of parties with booths but this one really was amazing - it was run with efficiency but humour, you could feature 1 person or a whole table, and getting the book as we left the wedding was quite amazing - brilliant to look at it the next day and see what people had done with their evening (some were rarely out of the booth by the looks of things!) We will recommend you to anyone who wants a photo booth. Thanks." "Just wanted to drop you a note to say thanks for Saturday. The guest book and photos from the booth are brilliant. All our guests loved it too." 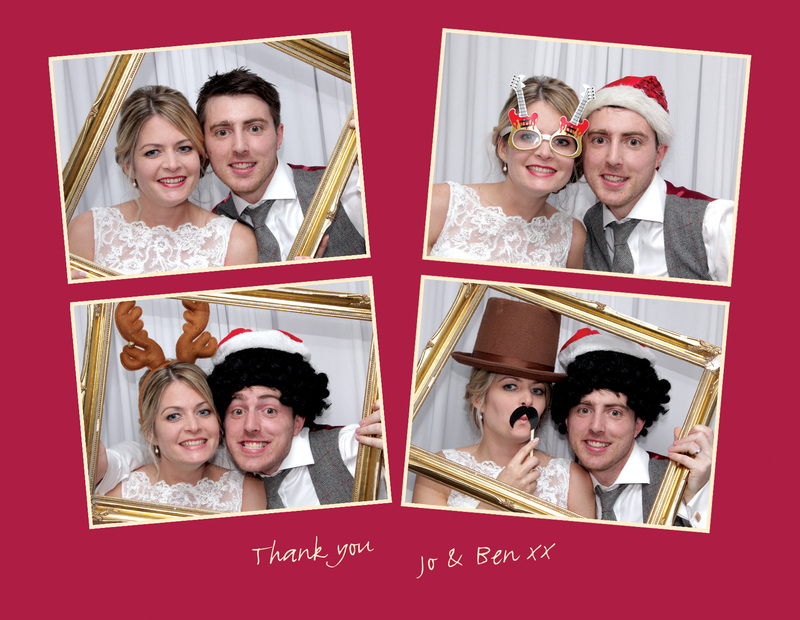 "I was interested in your PhotoBooth for my Brothers Wedding in September. I saw pictures from a recent wedding you attended for a friend and they looked fantastic"
"We would like to say a big thank you to Rentabooth for contributing to what was an amazing night at Barnsdale Hall on the 27th July! " "Hey, Your photo booth at Andy and Emma's wedding was awesome!!!" "Thanks again for last night. The feedback from people today about your booth has been amazing!" "I just wanted to say a massive thank you for the photo booth for our wedding at top meadow on Friday 31st August. The photo album is absolutely fantastic and we are so happy with the results. The feedback from the guests was all fantastic and we have already had people calling to ask for your details so they can book you for events." "It was wonderful to have you on the summer ball again this year, you have become a firm favourite with our members!" "We hired the rentabooth on 8th September for wedding at Birdshill. I just wanted to say a MASSIVE thank you. The guests loved it and still are talking about it now. The book we were presented with at the end was excellent and a perfect reminder of what a great night it was.I cannot recommend it enough and am sure that when my friends all start tying the knot they will think it compulsory to have a rentabooth! Once again thank you. " "This is my first day back in the office after our function on HMS Belfast and I just wanted to thank you for supporting us so well on the 12th. We were late running, and the weather wasn't brilliant but you captured the mood of the party so well with the photos and I know that Assistant Commissioner Allison was over the moon with his album.Many thanks again, and please pass on my appreciation to your team. I will certainly recommend you to future party organisers. " "You provided a photobooth for our wedding at Oakley Court on 20 April this year - we really loved it, as did all of our guests and the book that you prepared for us has kept us amused for hours following the big day!The only thing I would change about the day was to have hired the booth for an extra hour! " "Just a quick note to say thank you to you and the photo booth team who turned up on the night. They made us a fantastic album and were very polite, professional and everybody commented on how friendly they were.Also to say that the ipad next to the booth is a great addition for people to be able to look at the pictures of the night too. "